In the world of online video slots, Celtic-themed games are as common as ones obsessed with ancient Egypt or Norse gods, or a mixture of the two (Cleopatra's Thunderstruck - that's a game we'd like to see one day). And why break with tradition when you can bring out a slot filled with mystic runes, fiddly music and bonuses galore and watch the punters deposit their hard-earned in their thousands. This slot delivers everything you would expect from a NetEnt slot and even though the theme might be deemed "safe", it is certainly a slot attracted positive attention on release. Its early reception from the online slots players was very encouraging but it does feel like it lacks that cutting edge. 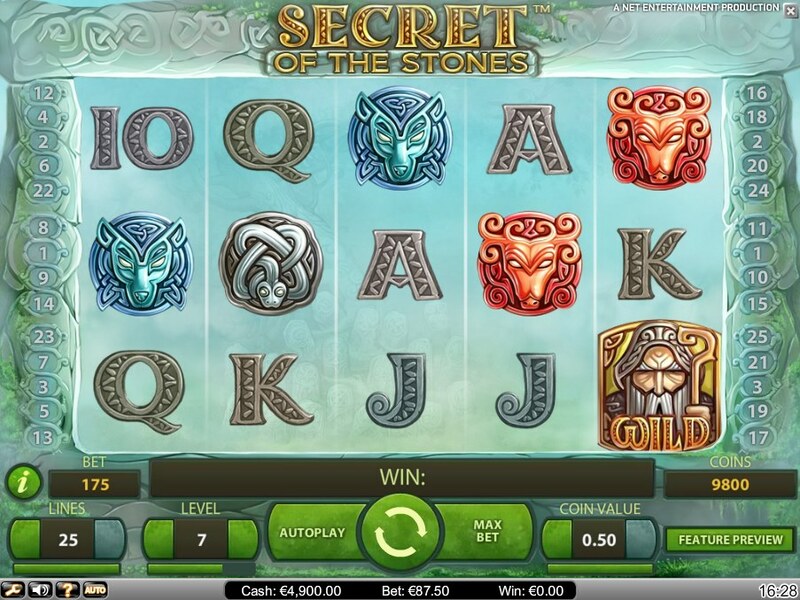 From the leading developer, NetEnt, Secret of the Stones is a 5-reel, 25-payline online slot filled with plenty of secrets and - yep, you guessed it - stones. In fact, the ancient Celtic stones form the corner piece (or should that be keystone) to this game, seeing as the reels are packed with engraved runes, beardy druids, carved owls, and nice Lord of the Rings-style Jack-through-Ace icons. Even the reels come to a halt with a satisfying stony thud after each spin. 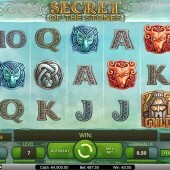 As with some of Leander Games’ recent new releases like the salon-based slot, Jean Wealth, Secret of the Stones has a juicy free spins round as its bonus - triggered by hitting three or more tree Scatters across the reels - but first you get to choose how many extras you'll receive via a pre-bonus Pick 'em Bonus round filled with Celtic tombs which reveal spins and multipliers. You automatically start the free spins with 10 freebies, but choose correctly from the stones and you can add on up to 10 extra spins plus multipliers and bonus round Wild symbols - the Deer and Owl. There's also a chance to hit Wild Reels which make Reels 2 and 4 totally Wild during your bonus round. It's no wonder, therefore, that there's a potential jackpot of 350,000 coins up for grabs, and with betting ranging from $0.01 to $0.50, that could spell potential big winnings for the lucky punter. Secret of the Stones may not tick many boxes marked 'Originality' but for Celt-heads eager to add some treasure to their pots, it could prove the fix you're looking for.